How to Reset Galaxy Note8 (Hard, Soft and Factory Reset) - Learn how to reset Galaxy Note8, Hard reset, Soft reset, Factory reset and master reset Note8. 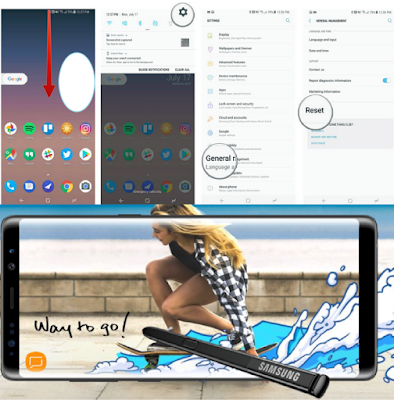 If your Samsung Galaxy Note8 freezes or encounters a fatal error, or got problems, try the following solutions. If the problem is still not resolved, contact a Samsung Service Centre. If your Galaxy Note8 fingerprint is not recognised, unlock the device using the pattern, PIN, or password you set when registering the fingerprint, and then re-register your fingerprints. If your pattern, PIN, or password is forgotten, you will not be able to use the device if you do not reset it. Samsung is not responsible for any data loss or inconvenience caused by forgotten unlock codes. If you are wearing gloves, if your hands are not clean while touching the touchscreen, or if you tap the screen with sharp objects or your fingertips, the touchscreen may malfunction. The touchscreen may malfunction in humid conditions or when exposed to water. Restart your device to clear any temporary software bugs. Ensure that your Galaxy Note8 is updated to the latest version. If the touchscreen is scratched or damaged, visit a Samsung Service Centre. If your Samsung Note8 freezes or hangs, you may need to close apps or turn off the device and turn it on again. If your Note8 is frozen and unresponsive, press and hold the Power key and the Volume Down key simultaneously for more than 7 seconds to restart it. If the methods above do not solve your problem, perform a Galaxy Note8 factory data reset. If you registered a Google account to the device, you must sign in to the same Google account after resetting the device. Be careful not to forget your unlock codes for the screen lock, accounts, and other security features. If you forget an unlock code, you will not be able to use the device if you do not reset it. Samsung is not responsible for any data loss or inconvenience caused by forgotten unlock codes. You can set up Galaxy Note8 to perform a factory data reset if you enter the unlock code incorrectly several times in a row and reach the attempt limit. On the Apps screen, tap Settings → Lock screen and security → Secure lock settings and tap the Auto factory reset switch to activate it. Follow all posted warnings and directions from authorised personnel in areas where the use of wireless devices is restricted, such as aeroplanes and hospitals. Delete all settings and data on the device. Before performing a master reset Note8, ensure you back up all important data stored on the device. From the home screen, swipe down on the notification shade. Tap on the Settings button (looks like a cog icon). Enter your PIN, password or pattern to proceed. Wait until reset completes. 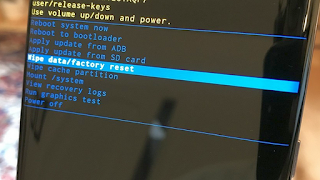 If for some reason your Galaxy Note8 isn't able to boot into Android and you still want to factory reset it, the instructions are little harder, but they accomplish the same thing. Turn off your Galaxy Note8 (if it's not already). 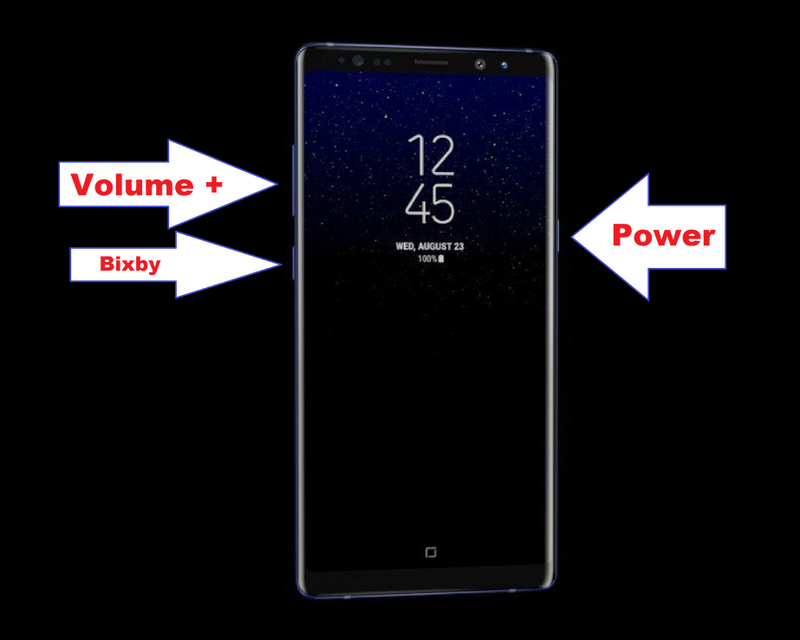 Hold down the Volume up, Bixby, Power buttons simultaneously until the Samsung logo shows up on the screen. You'll see an Android figure with the words No command on screen. Wait a few seconds. Once the black background with colored text appears on Note8, use the volume down button to scroll to Wipe data/factory reset. Use the power button to select Wipe data/factory reset. Use the volume down button to scroll to Yes. Use the power button to select Yes. If your Galaxy Note8 unresponsive, press and hold the Power key and the Volume Down key simultaneously for more than 7 seconds to restart it. If you forget your Secure Folder unlock code, you can reset it using your Samsung account. Tap the reset button that appears when an incorrect unlock code is entered, and enter your Samsung account password.